There were 6 posts published in September 2014 (this is page 1 of 1). I haven’t had much to say about the Apple Watch because there are so many things we don’t know about it yet. But there are some interesting things to speculate about. One idea that’s been floating around the Apple developer community is that apps for the Apple Watch will be extensions of iPhone apps. They’d run on the Watch, but be downloaded and installed as extensions of an iPhone app, and get to take advantage of the shared data container used by iOS app extensions. At first blush the idea makes sense, but the more I think about it, the more I don’t think it’s the way Watch apps will work. Ben Thompson pointed out that Apple is thinking long-term about the Watch. This approach – the one that Apple chose – allows the hard work of UI iteration and app ecosystem development to begin in 2015. Moreover, that iteration and development will happen with the clear assumption that the Watch is a standalone device, not an accessory. Then, whenever the Watch truly is standalone, it will be a complete package: cellular connectivity, polished UI, and developed app ecosystem. It will be two years closer to Digital Hub 3.0 than Alternative #1 or #2. The tradeoff is significant confusion in the short-term: the Watch that will be released next year is not a standalone device. It needs the iPhone for connectivity. To be clear, this is no small matter: the disconnect certainly tripped me up for a week, and if the feedback I’ve gotten is any indication, it continues to befuddle a lot of very smart people. Although today the Watch requires an iPhone for connectivity and other assistance, Apple is clearly looking forward to a day when it does not. With that in mind, it would be silly to constrain apps to mere iOS extensions. Why design an app ecosystem around the presence of an iPhone if your long-term goal is to make the watch a standalone device? I suspect that Watch apps will be installed and managed via a connected iOS device, but will run more or less autonomously. Something like Handoff will be used to pass data back and forth between the Watch and the iPhone. In the short run, Apple may also offload computational tasks to the iPhone CPU to save battery, but that will happen behind the scenes in such a way that developers don’t have to give it much thought. Over time, as the Watch becomes more powerful, it will gradually hand off fewer tasks to the iPhone. By making Watch apps independent of an iOS app container from the outset, Apple can make this transition as seamless as possible. Of course, we’ll know a lot more once we get a look at the SDK for Watch apps, hopefully sometime this fall or winter. I don’t think this logic pays enough attention to the fact that someone else will very likely be working with your code after you write it. Even if you’re a single developer, you might eventually pass that code off to someone else – maybe because you got a new job, or added a partner, or sold your app to another developer. Best practices are important because they help us make our code accessible to the next person who works on it. I also think developers should take care to make a language accessible to people who are new to it. That’s especially true right now with Swift – we’re all new to it! Keeping the language accessible might mean trading off some conciseness in favor of descriptiveness. Consider the examples above of concise standard library methods: map, reduce, stride, etc. You have to learn what they do before you use them. That’s a barrier that you have to overcome before you can start working in the language. The more of those there are, the higher the barrier becomes. As a developer community, we’re best off keeping those barriers as low as possible. I propose that the only real place where very short, concise names make sense is in the language itself. Essentially, this refers to things like map that are already built into Swift. We’ve got autocomplete to help us with the rest, and Swift already reduces some of the extra typing from Objective-C.
Why does this all matter, and why have I been ruminating on it for the past couple of weeks? Because Swift is new, we have a unique opportunity to shape its conventions. I’ve done some Ruby programming in the past, and although it’s a nice language, I don’t want to develop iOS apps in it. I think the iOS and Mac developer communities will do themselves a favor by sticking to longer, more descriptive method names in all but the rarest of circumstances. And there has to be a time limit. I forget who proposed the 45-minute rule for CSS, where you give up and just use a damn table for your layout. I don’t want to be too quick to punt when using Swift, because it means I won’t be learning as much as I could be (and I need to become expert: that’s the point), but I also can’t let my productivity go too far from what’s normal. I’ll give myself two hours of banging-head-on-disk, then punt. As a rough guideline. (I’m not actually going to use a stopwatch.) This number may change, but it’s important to have some limit as I’m doing this. Apple Watch iPhone iPad ??? Does the Apple Watch really fit into a size class smaller than “compact,” and/or does it use size classes at all? Does the use of “regular” as the biggest current size class imply the existence of a “large” class in the future? Where does the Apple Watch fit? It could be that the Apple Watch exists outside the size class system entirely. Apple’s web site makes reference to something called the “Watch OS.” We don’t know much more about it than that, but even if it’s distinct from iOS, it’s likely to be strongly related. The odds are high that it’s using size classes under the hood somewhere, even if it’s not exposed to developers by name. After all, why create a system for flexibly adapting to different screen sizes if you’re not going to use it on a new, differently-sized screen? Either way, we’ll know a lot more about this once we get a look at WatchKit. Both the iPad Air and the iPad mini have a “regular” size class in both dimensions, which implies that Apple is at least leaving room for something larger than the iPad. The likeliest explanation is that they’re keeping their options open for shipping larger devices in the future. Maybe a larger “iPad Pro”? Or perhaps an Apple TV SDK, in which the TV has a “large” size class. Time will tell. Yesterday Apple introduced two new iPhones, which means it’s about that time when people to start asking me what phone they should buy. Since I often find myself repeating similar advice to a lot of people, I thought I’d jot down a few thoughts. The newest models come in two sizes: the iPhone 6 at 4.7″ diagonally, and the iPhone 6 Plus, weighing in at 5.5″. By comparison, the iPhone 5 and 5S both measured 4.0″ on the diagonal. Both phones are offered in 16GB, 64GB, and 128GB capacities. 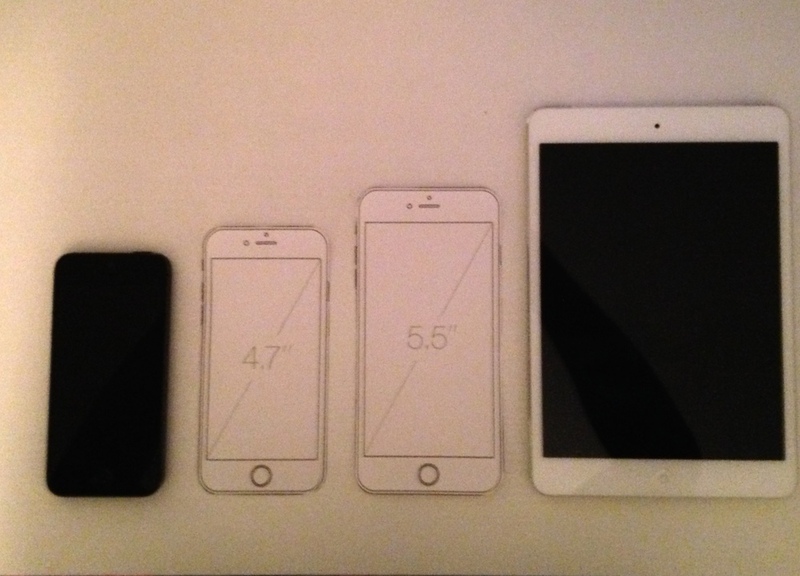 Screen Size: Obviously, the iPhone 6 Plus is significantly larger than the iPhone 6. Optical Image Stabilization: The two phones share most of the same camera technology, but the iPhone 6 Plus also contains optical image stabilization as well. Apple says that it will result in clearer pictures in low-light situations. Price: All iPhone 6 Plus models cost $100 more than the equivalent iPhone 6 model. For example, the 16GB iPhone 6 costs $199 (on contract), while a 16GB iPhone 6 Plus will set you back $299. My advice on choosing between them? It really comes down to personal preference. I don’t think the image stabilization will be a big deal for most users, and the iPhone camera is already quite good for a phone, so I think we can mostly set that aside. I also doubt that the battery life between the two models will be different enough in real world use to be noticeable for most people. That said, if battery life is a big issue for you, that might tip the scales in favor of the iPhone 6 Plus. Personally, I’m not a fan of really giant phones like the 6 Plus. Additionally, over the past few months I’ve run out of space on my 16GB iPhone 5 time and time again. I’m fairly certain I’ll end up buying a 64GB iPhone 6. I usually buy a new phone every other year. I bought an iPhone 4, skipped the 4S, bought the iPhone 5, and skipped the 5S. In large part, that’s because I’m not willing to pay full price for new phones, and every two years feels about right to me. However, I do advise people to buy iPhones early in their life cycle. For example, if you’re going to buy an iPhone 6, get it this fall instead of waiting until the spring. If you buy a phone in spring 2015, for example, you probably won’t be eligible for a new carrier-subsidized phone until spring 2017. Then you have to choose whether to buy another new phone that’s been out for six months, or wait unil the fall. Furthermore, it used to be true that iPhone releases in even-numbered years were the “big” updates (iPhone 3G, iPhone 4, iPhone 5) and odd-numbered years were more incremental updates (3GS, 4S). That pattern has subsided a bit in the past couple of years, so I’m not sure it’s worth worrying about anymore. For example, you could argue that the iPhone 5S, with its powerful processor upgrade and TouchID sensor, was a bigger upgrade from the iPhone 5 than the iPhone 6 is from the 5S. Basically, if you’re eligible for an upgrade when new iPhones come out and you like the new models, go for it. Of course, if you like your current phone and it’s running great, you can always hang on to it. Just remember, it’s extremely unlikely that there will be any new phones from Apple between now and next fall. iOS 8 will run on phones back to the iPhone 4S, although it’s likely to be fairly slow on the oldest devices. My guess is that it’ll run just fine on an iPhone 5. The header defines a Message class with a number of properties, as well as a method for replying to the message and a class method for downloading all messages. It’s easy to tell from looking at the header what functionality it exposes to other classes without needing to worry about how it’s implemented. The header also hides any private variables that other classes don’t need to know about and don’t have access to. The Swift class intermingles the interface and the implementation, as well as public and private properties and functions. We can see all the guts of what the class does under the hood, even though that’s not relevant to someone who just wants to use the class. Moreover, it’s conceivable that some of these functions would be long. (I’ve omitted an actual implementation here for the sake of this example.) That means a lot of scrolling and scanning through code just to see what functions are available. As you can see, it’s very similar to an Objective-C header. However, we didn’t actually have to write it manually, and there’s no actual file associated with the header. It’s just a view of the class generated by Xcode for convenience. This view would be uneditable, and would be automatically updated by Xcode as the Swift code changes. In practice, this would be a lot like developing in Objective-C using the “Counterparts” mode in the Assistant Editor to display header and implementation side-by-side. In short, the “header view” would give developers all the benefits of headers without actually having to write them. UPDATE 9/6/14: I’ve filed a radar requesting this enhancement. Please consider duping!